Image: Ratan Tata (R) and Tata Group Chairman Cyrus Mistry attend the launch of a new website for tech superstore Croma in Mumbai. With Adani Power acquiring the 600-Mw Korba West plant from Avantha Group, Tata Power will soon become a distant second in terms of the largest private power producers in India. The Gautam Adani-promoted Adani Power is set to become the country’s largest private power producer, with an installed capacity of 11,040 Mw. Currently, Adani Power has operational capacity of 8,580 Mw, against Tata Power’s 8,613 Mw. But the Ahmedabad-based Adani Power’s capacity will soon be enhanced, with an expected announcement of the commissioning of the fifth 660-Mw unit at Tiroda in Maharashtra. Besides, it had acquired the 1,200-Mw Udupi plant from Lanco Infratech in August. Once the Udupi and Korba acquisitions are completed, Adani Power’s total installed capacity will stand at 11,040 Mw. It further has the ambition to take it to 20,000 Mw by 2020. 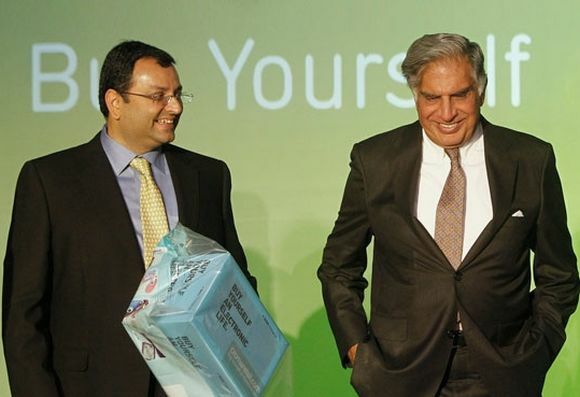 Power is Tata Group’s second core business in which it has lost its leadership position in the domestic market. Earlier, it had lost the position of India’s largest private steel producer to JSW Steel, when the Sajjan Jindal-promoted company raised its domestic production capacity to 14.3 million tonnes (mt) with the acquisition of Ispat Industries in 2011. JSW Steel plans to raise its total capacity to 40 mt by 2025, with six mt brownfield expansion in Bellary, Karnataka, and greenfield plants in Jharkhand and West Bengal. Currently, Tata Steel has a capacity of 9.7 mt in Jamshedpur; it is developing a six-mt plant in Kalinganagar in Odisha. In 2007, it had acquired Anglo-Dutch Corus for $12.1 billion to become the world’s fifth-largest steel maker, with a capacity of 25 mt. 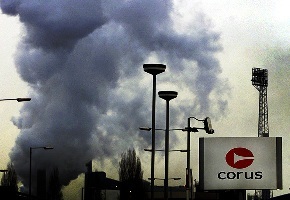 However, this became a drag on the company’s financials, as demand slumped in Europe after the economic crisis of 2008. “It is possible in its effort to become a global powerhouse, the Tata group lost some ground to domestic rivals,” says Dhananjay Sinha, economist and strategist at Emkay Global Financial Services. Tata Steel could not be as aggressive in bidding for Ispat Industries, as its hands were tied due to Corus’s strained financials. In the domestic market, the group has also lost ground in the passenger car business, with Tata Motors slipping from the third to the fifth position in the past two years; Mahindra & Mahindra and Honda Motors surged past it. However, Tata Motors’ 2008 acquisition of Jaguar and Land Rover for Rs 9,200 crore or Rs 92 billion has proved to be a money spinner. “Despite their foreign forays, the Tata group essentially remains an Indian group and the fact that it has lost ground in the domestic market is more by accident than design,” says Jacob Mathew, managing director investment banking firm Mape Advisory Group. In India, Tata Power is struggling, with capacity of 7,000-8,000 Mw in the pipeline. But it is progressing smoothly in terms of setting up capacity of 2,600 Mw abroad, including 1,200 Mw in Vietnam, 600 Mw in Myanmar and 400 Mw in Georgia. 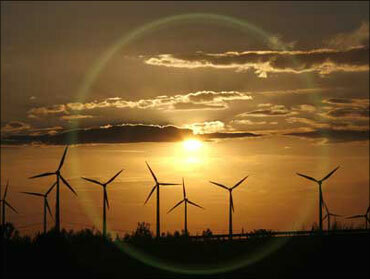 “India projects may remain at 7,000-8,000 Mw even after five years. And, there is a likelihood that our foreign expansion will overtake,” Anil Sardana, managing director of Tata Power, had said in a recent interview with Business Standard. The company has set a target of adding 10,000 Mw of capacity by 2022 in India and abroad, against Adani Power’s target of achieving 20,000-Mw capacity by 2020. Besides, it has business in all the segments of the power sector, including transmission network and power distribution, with consumer base of more than 1.9 million in Mumbai and New Delhi. Hence, it still claims to be the largest integrated power company. In the domestic market, the Tata group remains a dominant player in sectors such as hospitality (Indian Hotels), commercial vehicles (Tata Motors), tea (Tata Tea) and watch and retail jewellery (Titan Industries). Amazing story of how Ratan Tata built an empire!